It's curtains for a famous Broadway director, and private investigator Nero Wolfe is on the case--but his assistant, Archie Goodwin, is a suspect. With a mind to suss out useful backstage gossip, Wolfe turns to his faithful assistant, Archie Goodwin, to impersonate a journalist in order to speak to the cast. Though Goodwin's conversations prove unfruitful, on his last day at the theater, the director is murdered in his soundproof booth, poisoned by an unseen culprit during an evening performance. In short order, an actor whose health is failing attempts suicide with the same poison. Now Goodwin is a prime suspect in the director's demise, effectively sidelining him for the rest of the case, and freelance gumshoe Saul Panzer must step in to help wrangle the various members of the play--from the ing nue and the diva to the handsome movie star and the surly stage manager--so New York's smartest, and most reclusive, private detective can determine who is responsible for these dramatic deaths and clear Goodwin's name once and for all. Continuing his beloved series--which also includes Archie Meets Nero Wolfe, Murder in the Ball Park, and Archie in the Crosshairs--Nero Award-winning author Robert Goldsborough "brings Nero Wolfe, late of Rex Stout, gloriously back to life" (Chicago). Murder, Stage Left is the 59th book in the Nero Wolfe Mysteries, but you may enjoy reading the series in any order. Robert Goldsborough (b. 1937) is an American author best known for continuing Rex Stout's famous Nero Wolfe series. Born in Chicago, he attended Northwestern University, and upon graduation went to work for the Associated Press, beginning a lifelong career in journalism that would include long periods at the Chicago Tribune and Advertising Age. While at the Tribune, Goldsborough began writing mysteries in the voice of Rex Stout, the creator of iconic sleuths Nero Wolfe and Archie Goodwin. Goldsborough's first novel starring Wolfe, Murder in E Minor (1986), was met with acclaim from both critics and devoted fans, winning a Nero Award from the Wolfe Pack. Six more novels followed, including Death on Deadline (1987) and Fade to Black (1990). In 2005, Goldsborough published Three Strikes You're Dead, the first in an original series starring Chicago Tribune reporter Snap Malek. 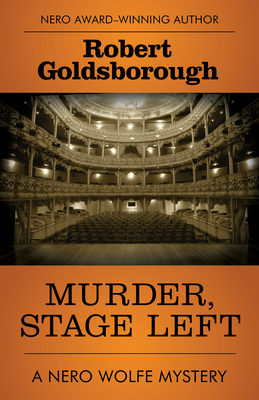 Murder, Stage Left (2017) is his most recent novel.